Lock in a great price for Auberge du Lac Taureau – rated 8 by recent guests! Bedrooms have a small balcony with a nice view of the lake. Good location for snowmobiling, Beds are comfortable, Coffee very good in the Bistro. Staff generally accommodating especially cleaning staff in the rooms, they were the only ones that offered help with bringing up the luggage to the 3rd floor of the annex. Great location for winter sports. We rented a skidoo for one day, that was amazing. They have beautiful cross-country ski trails and to do snowshoeing, and we even tried fat-bike! The meals (breakfast and dinner) are just amazing with the quality of the food and the diversity. The hotel is really nice. The inside pool is so big, you can do swim lengths, and the external pool is heated at 95 degrees! They also have spas and saunas. Just amazing! The food was amazing but you need to make reservations. We enjoyed cross country skiing which was included in our package. The bistro had a great vibe to enjoy an afternoon drink and snack after outdoor activities. Everything is so good. Food is delicious and beds are comfortable. There are so many activities to do on site. We passed the whole weekend there, even no need to go out of the hotel! The meal was great. Very nice lake with lots of beaches. Auberge du Lac Taureau This rating is a reflection of how the property compares to the industry standard when it comes to price, facilities and services available. It's based on a self-evaluation by the property. Use this rating to help choose your stay! Boasting spa services, fine dining, and a variety of summer and winter activities, this waterfront resort in Saint-Michel-des-Saints, Quebec features views of Lake Taureau. 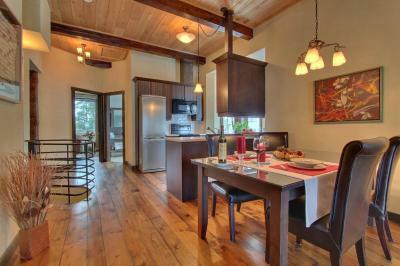 The rustic guest rooms at Auberge du Lac Taureau include stained hardwood flooring and a marble bathroom. 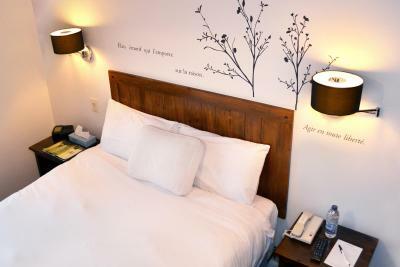 A cable TV, free WiFi and a coffee maker are provided in each room. 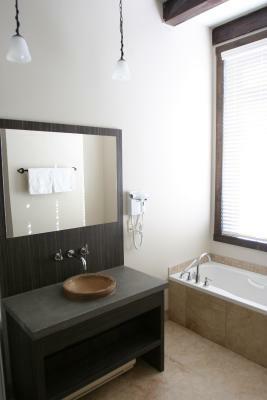 During their stay, guests can relax at the indoor pool, hot tub, or sauna. 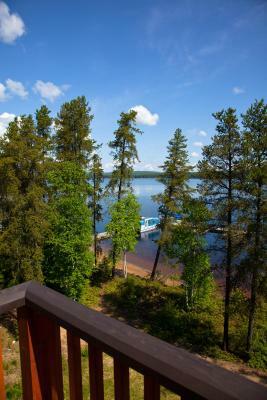 Guests can also go canoeing, cycling, bear watching, and dogsledding. In the evenings, gourmet cuisine is served in the dining room. The on-site bistro offers salads, soups, and sandwiches starting at noon. The bistro's bar has a full-service bar and billiard tables. The center of Saint-Michel-des-Saints is 9.3 mi from Auberge du Lac Taureau. When would you like to stay at Auberge du Lac Taureau? This room features views of the lake. This condo features a fireplace, kitchenette, living room area, and views of Lake Taureau. This room features views of the forest or the property. House Rules Auberge du Lac Taureau takes special requests – add in the next step! Auberge du Lac Taureau accepts these cards and reserves the right to temporarily hold an amount prior to arrival. Breakfast is not included in the room rate and must be paid directly at the hotel upon check-in. A brunch is served on weekends, as well as every day between June 25 to August 28, 2017. The property has a per night resort fee which includes services and activities. The fee should be made payable directly to the property. -Shower was extra slippery, blinds in room let sun in the morning, long walk To go slidding and horrible hill to slide. It shouldn't even be an activity. Beds were a little hard. Make sure you bring bug spray because it will be very expensive to purchase on site! Also, extra fees of $25 + tax per night were not clearly indicated and we had to go to Reception twice to clear that up. The site is beautiful. The beach is clean and the water so clear. Many water activities were included. We had a lakeview room with a spectacular view. Also, if you are looking for a relaxing massage, Guillaume and Simon are highly recommended. Ventilation system is very close to the bed and very loud. It’s a beautiful place, great facilities and offers many activities. It is, however, a bit pricey. Be sure to select the right package for you and look out for deals. Better help with luggage as there are no elevators in most of the annexes. No cheap food after 4:00 pm. Must wait for dinner at 6:00 at $52 per person for a buffet , tips and gratuity included. Closest village is in St. Michel des Saints which is a good 15-20 drive on treacherous roads. So you are stuck unless when you sled/snowmobile during the day you bring yourself an empty pack sack, stop at the Provigo in St.Michel and buy /have sandwiches for your dinner or for your late night snack. a bit noisy, due to families and events, walls of wood do not isolate from noise. High charges for all the amenities. Bed not comfortable . Rooms outdated. Expensive. Overall beautiful facility and beach. Did not have a balcony.